Melksham Carnival is hosting a vintage tea party next month, which will set the stage for the climax to the search for this year’s carnival royal family. Melksham Carnival committee member and carnival royalty guardian, Beth Dark says, “This year we will be selecting our Carnival Queen, Carnival Princesses and Carnival Page at a vintage tea party event on Saturday 9th March at the Canberra Centre, from 11am to 3pm. Please join us and dress to impress! “Tea will be served in the finest bone china and there will be tea, cakes and sandwiches on offer. People in the running for carnival royalty selection will have an on stage interview before have a one-on-one chat with the judges, accompanied by their guardian if necessary. We will also have some wonderful entertainment by some local young talent in the interval. “All entries are £4 per contestant and this entitles you to free entry to the event including refreshments. Entrance will be £4 per person not entering the royalty competition and under 3 year olds enter for free. 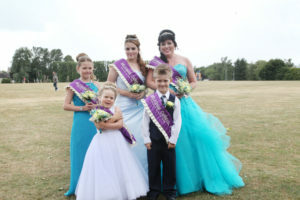 “This year’s royalty are our Queen (aged 18+); three Princesses, (from reception age to 17 years old); and carnival Page (from reception age up to 15 years old). Your child will be placed in the correct category by the admin team at the event. Everyone is welcome! The event takes place on Saturday 9th March at the Canberra Centre on Spa Road from 11am to 3pm. This year the Melksham Carnival will parade through the town one month earlier than normal on Saturday 29th June. For more details about the royalty selection event and about taking part in this year’s carnival, send the committee a message via the ‘Melksham Carnival’ Facebook page. Above: Last year’s Melksham Carnival royalty braved the wind and rain on the day of the procession.